Forget the little trim or subtle highlights that will invariably escape your boyfriend’s notice—we are talking full-on, reality-TV makeover! The Law Student’s Wife has a whole new do! I couldn’t be happier with the site’s revamped look and to celebrate, I am hosting my first ever GIVEAWAY! Connect to your inner freebie-loving student folks: we’re talking FREE STUFF! Enter for a chance to complete some holiday shopping—be it for yourself or others—from the comfort of your couch. First, an immense thank you to Carolyn Miller, the creative force behind my blog’s new look. Carolyn designed an incorporated every graphic you see, handled numerous revisions, and (on top of being unbelievably talented and professional) is an absolute doll. To anyone on the prowl for a graphic designer, do yourself a favor and check her out. Carolyn can be contacted for a range of design requests here. Even when I fail to thicken a stubborn cream sauce, burn my pie crust edges, or spill powdered sugar e-v-e-r-y-w-h-e-r-e, I can take comfort in one, unshakable truth: I look good doing it. Forget the make up and pearls. My secret to feeling flirty in the kitchen, dough-crusted sweatpants and all: my apron! 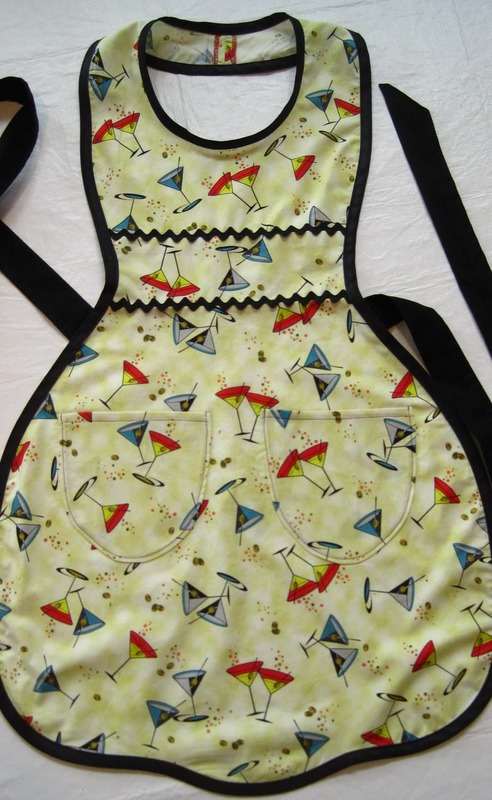 Whether you have guests arriving and want to look your best while cooking, or like me, you simply want a pinch of pizzazz while you’re standing over the stove, a cute apron is a snazzy way to add style to your kitchen. We spend hours cooking—why not look and feel fabulous doing it? 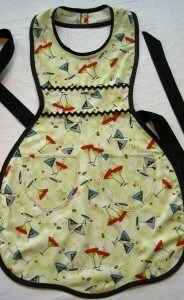 I am all aflutter for these unique, handmade aprons from the Etsy shop MitzieAprons4U. Seriously, how cute is this? Sweeter than cherries. Mitzie, the creative force behind these adorable aprons, offers a wide range of apron styles and sizes, and one lucky winner will be able to choose ANY apron from her shop! BONUS: With holidays approaching, a one-of-a-kind apron makes a lovely gift for that aspiring cook, professional chef, or Hostess-with-the-Mostess in your life. For up to FIVE entries to win the MitzieAprons4U apron of your choice, complete the following. Each will earn you a separate entry to the giveaway. Entry 1: This is the only mandatory entry. Visit Mitzie’s Etsy shop here and leave a comment on my blog below with a link to the apron YOU would choose if you won! Entry 2: Like The Law Student’s Wife on Facebook here and leave a separate comment saying you did so. Entry 3: Subscribe to The Law Student’s Wife RSS feed OR become an email subscriber (enter your email address in the space provided at the upper right of this webpage) and leave a separate comment saying you did. Entry 4: Tweet about the giveaway saying, “I just entered the @LawStudentsWife unique apron giveaway! #giveaway bit.ly/TkeWDJ” and leave a separate comment saying you did. Entry 5: Follow @LawStudentsWife on Twitter and leave a separate comment saying you did. The giveaway will be open until 12 midnight C.S.T. on Wednesday, December 5th, and I will announce the winner on Thursday, December 6th. note: Mitzie is graciously providing the apron for the giveaway. My opinions are my own and were not influenced by any form of compensation. Good luck all and happy holiday shopping! Last and most importantly, what do you think? Have any thoughts on my new design? Run into annoying technical glitches? Let me know! I’d love your thoughts and feedback. **GIVEAWAY ENDED** Congrats to Jenn, the winner of a lovely and festive holiday apron! You will be one sassy lady as you pull cookies out of the oven this season! Hey Erin! I would choose THIS apron: http://www.etsy.com/listing/86902764/reversible-fun-and-flirty-pink-flower. I could use something cute to wear while studying for finals! P.S. – I just liked you on facebook as well! P.P.S – that pear dessert that I can’t pronounce – made it a couple weeks ago and it was DELICIOUS! No matter how you pronounce it, clafoutis is a yummy choice indeed! I’m so glad you liked it Cary. Hearing about people liking/trying my recipes always makes my day! p.s. I liked you on facebook too, but only because there wasn’t a ‘love’ button. p.p.s. I just subscribed to this website also. p.p.p.s. I really should have read all the entry steps at once to avoid all these posts. oops! No, you did it perfectly Kathryn! Thanks so much. You = THE BEST! Hey Erin! The new site looks great! Can’t wait to see what other delicious recipes you’ve got in the works! I also email subscribed and liked the facebook page. If I were to get an apron, I would choose this one, but it’s difficult as they’re all so cute! Thanks so much Andrea. So cute! The new header looks fab – congrats! 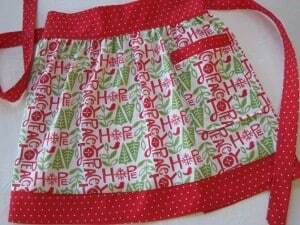 And if I were lucky enough to win your giveaway, I’d love the Christmas holiday half apron – it’s darling and would be just perfect for all the holiday baking I’ve got planned! LOVE that one too! Thanks Rachel! I always make great plans to cook/bake what you post… and then I don’t. Maybe with this apron, I’ll stop making excuses and start making PIE. Cheesy. Sorry I’m not sorry. You and your blog are awesome. The holiday apron is definitely my favorite! Aren’t they perfect for cookie extravaganzas? Thanks Meli!! Hi, Erin! Love the blog, new design looks great! This is my favorite apron (I think, they are all darling so it was hard to choose one!) – http://www.etsy.com/listing/107999865/blue-and-green-multi-pattern-half-apron. I also “liked” your Facebook page and became an email subscriber. Thanks! Thanks so much Jenn! Cute choice!! I also liked “The Law Student’s Wife” on Facebook. I also liked TLSW on Facebook! I would choose this one! I also tweeted and FBed! Love the new look, Erin! You rock. Ah so cute! I love the colors too. GO IRISH! AND you have a FB page now? Impressed, again. And LOVING you there! Gobbling up every post through GoogleReader since Day 1! Following you on Twitter, too. Stalk much? TOTALLY your colors Jake. Nice choice! This apron is sooo cute! Would love to win it! Thanks for the giveaway! Doesn’t she has so many adorable ones? Thanks for entering Chelsea! I would choose the Red Polka Dot Halter Apron! So cute! I’m such a sucker for polka dots. Way cute Amy! Loving the blog and the new look Erin! YES to ND colors! Lovely choice Jess. Here’s comment 1 of 5! Be back in a sec! Cracked me up about your boyfriend! I think he should appreciate your “guidance” lol. Thanks for entering and glad you like the banner! I signed up for email!!! I followed you on twitter!!! I liked you on facebook and subscribed to the blog….I love it!!! 2 of 5! I liked your FB page! 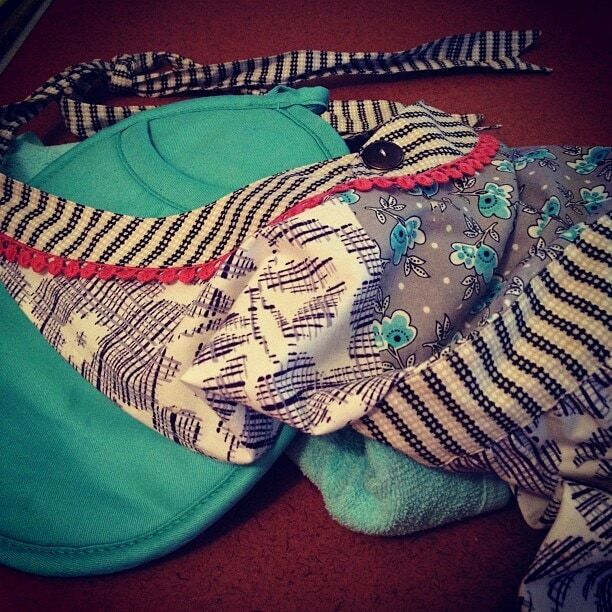 Blog looks great, can’t wait to try out some recipes in a sweet new apron! Blog looks great, can’t wait to try out some recipes in a new apron! LOVE the new look!!!!! :-) the domestic diva apron with cherries is so fun!!!! Absolutely Mitzie! It’s a fantastic motto that is so fitting for your wonderful creations. Thanks again for making this giveaway possible! Look at your pretty new site!!! LOVE it, lady! Thanks so much Ashley! It was quite the project but completely worth it. 3 of 5! I followed you on Twitter. Well, Ms. Erin (yeah, I know you’re a Mrs.) … it’s not easy to decide. I do not think I have EVER seen a more attractive looking apron than the Red Polka Dot Halter Style Apron (http://www.etsy.com/listing/112713477/red-polka-dot-halter-style-apron). BUT, the Blue Denim with Tiny Cherries Utility Apron (http://www.etsy.com/listing/107761267/blue-denim-with-tiny-cherries-utility) would be so handy that it might win out. What I am REALLY hoping is that I win and Mitzie will make me a halter style apron in a dark colored fabric (you know how messy I am) with the 4 utility pockets … that fits someone as tall as I am :) Mitzie, if you read this, let Erin know that you’re up to the challenge, so that she picks me as the winner! 4 of 5…..I RT’d your giveaway tweet from my personal account. I love your blog! I got into the slightly strange/amazing niche of foodie blog/lit novels a few years ago (‘A Homemade Life’, ‘Lunch in Paris’, ‘Cooking for Mr. Latte’…) and it is exciting to see a new talent take off. I hope you’re quite successful! Great idea with the giveaway/promo too! Thank you so much Georgia! Love your suggestions too. I will have to check them out! Liked on Facebook too. Good luck with your venture! Liked on Facebook and Twitter too! Good luck! I like the way you cook!! andddd 5 of 5…you’re all up in my inbox! =) have a great weekend! Great choice :-) Thanks so much for commenting! Nice choice! Thanks Jess :-) Excited to have on the site! 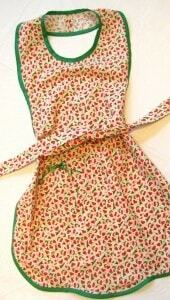 Just tweeted about the lovely cherry apron! Great giveaway :). And I followed @lawstudentswife on twitter! Can’t wait to try some of your recipes! Erin! The site looks great! Keep cooking up a storm! I think it’s appropriate that I like this apron. What made you deside to revamp? Was it tough? I would love to do it but am afraid it will be too much work. These aprons are so cute! Awesome idea for your first giveaway!!! I can’t lie–it was A TON of work, but so worth it! I wanted a design that was more reflective of my personality, cooking, and style. I love the way it turned out and would put in the time all over again. If you have the drive, I say go for it. Glad you like the aprons! Aren’t they fabulous? Thanks for taking the time to write me back. What was your first step? How did you choose who to contac? Also, I liked you on facebook. (And in real life). So cute! I know, it’s a hard choice indeed. Thanks Susan!! I also love this blue polka dot number: http://www.etsy.com/listing/116757636/polka-dot-apron (maybe it’s a Boston thing?) A fantastic new look to your site, congratulations! Thanks so much Lindsay! And that apron is absolutely adorable. Maybe it’s the classic look with a little twist that makes it Boston perfect?